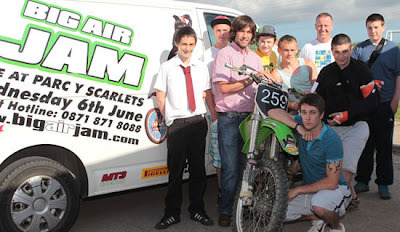 Pictured (l-r): Cameron Bryant, Callum Ackery, Mark Thomas of MT3, Corey Evans, Kalum Williams, Huw Thomas Senior Youth Worker, Matthew Peake, Sam Peake and pictured front Champion rider Dan Evans, 21, who works at y Bwlch when not out on the track. Young people who participated in the Bwlch Rangers Motocross Project will be trained as judges at the Big Air Jam freestyle Moto-X Championship, held at Parc y Scarlets, on Wednesday 6th June. Previously held at Margam Park and Silverstone, the big air jam has a line-up of extreme sports stars and some of the best stunt actions which will be held on mini bikes, trials bikes and BMXs. The Bwlch scheme, devised by bike enthusiast and Senior Youth Worker Huw Thomas, has captured the imagination of scores of youngsters. It provides them with a safe environment in which to learn how to ride motorbikes properly, while also gaining qualifications in motor mechanics. Mr Thomas said: "The group of young people have been trained hard to judge the riders performance, so riders may find themselves facing their harshest critics yet. This is a huge accolade for the young people; they are delighted to be participating in such a prestigious event and are looking forward to be judges on the night. "The young people appreciate the amount of skills that are required by bikers in these events and know only too well the hard work and dedication it takes to become professional bikers; they are very worthy candidates and I'm so pleased that they have been asked to judge at this level." Some of the finest freestyle motocross riders in Europe will be showing off their gravity defying skills featuring the UK's best freestyle riders including Chris Birch - X-fighters pilot and current British Champion; Jamie Squibb - former Big Air Jam Champion; John Pearson - first rider in the UK to pull the back flip on a motocross bike; Danny Veale, Stuart Macey, Ben Robinson and Jon Ritchie.Doors open at 6pm and the event promises to be a fun-packed night for all the family. Gates will open at 6pm to gain access to the South Stand with fairground activities available from 4pm. For further information on the event, please visit www.facebook.com/bigairjam or to purchase tickets, please call Parc y Scarlets' Ticket Office on0871 871 8088.